An excellent understanding of the theoretical aspects of teaching English as a foreign language. The ability to apply the theories and different approaches of teaching English in the classroom. An understanding of Thai culture and etiquette. An understanding of how people learn a second language. The ability to adapt to the needs of particular types of students. Develop specific skills and strategies to teach English to people of all ages. An ability to plan lessons and be flexible. Be able to self assess teaching methods and understand feedback. Insight English uses the teaching approach of Presentation, Practice and Production (PPP). The “Three Ps” approach to language teaching is the most common teaching methodology employed by professional language schools all over the world. 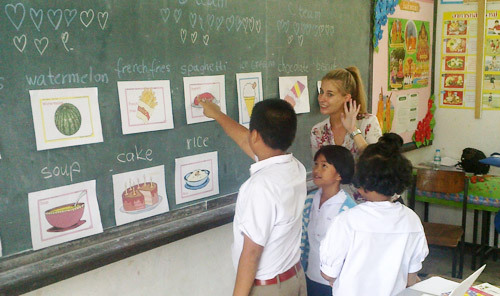 As part of our comprehensive TEFL course, we provide 20 hours of teaching observation and practice at Thai schools that are close to our training centre in Cha-Am. 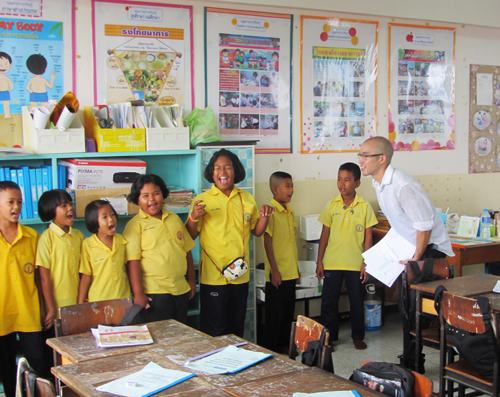 Our students can then put their new knowledge into practice by teaching Thai children in the latter part of the course. Insight English is licensed by Thai Ministry of Education and this teaching observation and practice is necessary so that our students pass the course and receive a TEFL certificate that qualifies them to teach English as a foreign language. Learning the methodology and theory of teaching English to non-native speakers, combined with teaching observation and practice ensures that our students are well prepared for their first English lesson when they start their job after the course. For further information regarding the Insight English TEFL course please contact us here.